It is now a best of three as the Boston Celtics regroup back in the TD Garden following a narrow loss to the Milwaukee Bucks in game 4. Boston overcame a 20-point deficit to rally and almost beat the Bucks but lost 104-102. Jaylen Brown carried the Celtics with 34 points and a team-high +10 rating while Bucks superstar Giannis Antetokounmpo answered with 27 of his own. Boston's porous first-half offence was to blame for their loss. The Celtics only scored 35 and only shot 41.4 per cent for the whole game compared to Milwaukee's 52.1 per cent. Despite having the frontcourt advantage, the Celtics surrendered 46 points and 14 blocks. They outrebounded Milwaukee 52-45 but needs to tighten up on defence. The big three of Antetokounmpo and forwards Khris Middleton and Jabari Parker shot 56.8 per cent and combined for 66 points. Most significantly, Milwaukee's bench carried the Bucks. Led by Parker, Milwaukee's bench players all registered positive ratings and were mostly on the court when the Bucks built up their lead. The Celtics are still a better cohesive unit and it's unlikely the Bucks maintain their hot shooting especially in Boston. Defence will be the story here as Boston contains Milwaukee. They are 4-1 in their last five home games versus Milwaukee and are 6-1 ATS in their last seven games. This is a battle of attrition. Milwaukee may have the firepower and talent, but Boston is better equipped to win the long grueling wars. They get this done. It's the end of an era in Miami as Dwyane Wade could be playing his final game with the Heat or with the NBA. 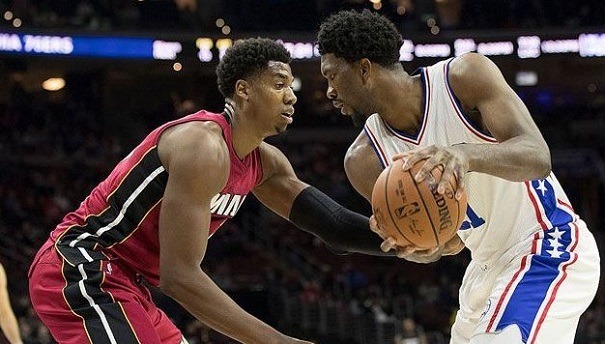 The Philadelphia 76ers should unceremoniously send Wade off by eliminating them tonight following their tough game 4 loss in which Miami failed to close out Philly after holding a double-digit lead for most of the game. Wade scored 25 points in 25 minutes but couldn't make the clutch baskets. It's a series that has become as physical as it is sloppy. Both teams combined for 46 turnovers and 53 points exchanged off these turnovers. Though Miami won the turnover battle (19 versus 27), they choked at the free throw line. Miami only made 13 of their 25 free throws while Philly nailed 27 of 35. Philadelphia also outrebounded Miami 65-56 though Miami attempted more field goals. Budding superstar Joel Embiid was neutralized for the most part only making two field goals but rookie phenom Ben Simmons was at it again with his first career playoff triple-double: 17 points, 13 rebounds, and 10 assists. The two combined for 15 turnovers, however. On Miami's end, Wade led all scorers but Hassan Whiteside was instrumental in shutting down Embiid. He played 26 minutes and posted a double-double. Containing Embiid, and locking down the perimeter (Philly only shot 22.6 per cent from deep) will do wonders for the Heat. But it's unlikely this happens again in Philadelphia, where they are 1-5 and 2-4 ATS in their last six. Embiid isn't going to make just two field goals and the Sixers won't miss 78 per cent of their three-pointers. This is a comfortable win for Philadelphia. Lightning will not strike twice as father time strikes the final time for Manu Ginobili and the San Antonio Spurs courtesy of a Golden State Warriors blowout victory. Not many expected the Spurs to beat Golden State in game 4 and even fewer thought it would be the 40-year-old Argentinian doing it. But returning to the Oracle Arena, this is the Warriors' time to close out. Game 4 was all San Antonio as the Spurs led for the entire game thanks to LaMarcus Aldridge's 22 points and Ginobili's 16 off the bench. The Warriors rallied late in the fourth but Ginobili ensured cut that short. Kevin Durant scored 34 for the Warriors but it was a poor shooting night for them. They only shot 37.8 per cent and only hit 25 per cent of their threes. Golden State also committed 18 turnovers to San Antonio's eight. They destroyed San Antonio on the glass outrebounding them 64-43 including 24 offensive boards to just seven from the Spurs but it was all for naught as the Warriors couldn't stop shooting themselves in the foot. But consider this game an aberration and a stay of execution for the Spurs. San Antonio is only 1-4 ATS in Oakland and have lost five straight. Expect it to be business as usual for Durant and the Warriors as they shoot much better and send the Spurs off and away from the NBA Playoffs in what would mark the definitive end to the 21-year-long Spurs dynasty.